With the jailbreak community once again reveling in delight after the release of the latest jailbreak that provides an untethered experience across the board on iOS 5.1.1, the expectant update and release of the iPhone Dev Team’s software-based Ultrasn0w unlock has finally come to fruition. For a lot of users, being jailbroken is only half the battle, with the ultimate goal being able to unlock their iPhone for use on all networks. Due to the intricacies involved in unlocking iOS devices through software, this version of Ultrasn0w doesn’t come with any additional baseband support, but serves to unlock the modem firmware: 01.59.00, 04.26.08, 05.11.07, 05.13.01, 05.12.01 and 06.15.00. If you are unsure as to what baseband your iPhone is currently running, you can check this by heading over to Settings > General > About and then viewing the Modem Firmware version number. If you are running iOS 5.1.1 with a compatible baseband (via Redsn0w/PwnageTool or Sn0wbreeze) then follow the steps below to unlock using the latest version of Ultrasn0w. Step 1: Before users can take advantage of the software-based Ultrasn0w unlock, the device must be jailbroken. The first step in the process is to jailbreak iOS 5.1.1 device with older baseband preserved via a custom firmware built using either the latest version of Redsn0w/PwnageTool or Sn0wbreeze. Step 2: When the jailbreak process has been completed, the Cydia icon will be present on the home screen. Launch Cydia and wait for all data to reload from the default repositories. Step 3: Cydia provides content to users that are hosted in specific repositories. Due to the fact that Ultrasn0w is provided by the iPhone Dev Team, it is hosted on one of the default repos that come pre-installed with Cydia, meaning no additional repository needs to be added. 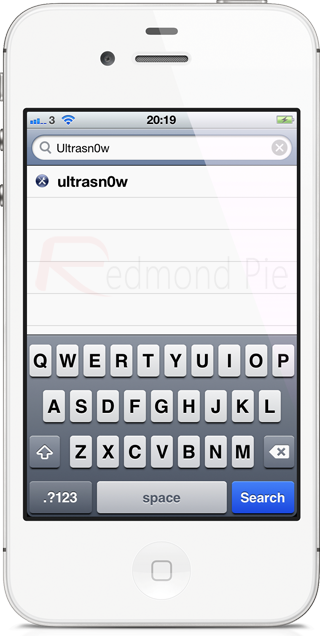 Select the ‘Search’ option from bottom navigation bar and type in ‘Ultrasn0w’ before hitting search. Step 4: For the sake of education, if for some reason you actually need to enter the repository it can be achieved by selecting the ‘Manage‘ option followed by the ‘Sources‘ button and then selecting ‘Add’ in the top left hand corner. In the pop up box which you will see on screen, enter ‘http://www.repo666.ultrasn0w.com‘ and hit ‘Add Source’. Step 5: Select the Ultrasn0w package from the search results list and select ‘Install‘ on the top right hand corner of the interface. Step 6: Confirm the installation of the package and allow the installer to go to work until it prompts that it has finished. Step 7: Select the ‘Restart Springboard‘ option to reboot the device. When completed, the iPhone should be unlocked for use with any network of your choice. There is a denial of access for a lot of cheap սոⅼοсkings in the AT&T data base, that causes a large amount of the third party սոⅼοсking sites unable to սոⅼοсking AT&T anymore. However, there are still sites that can do the job, just google atttiphoneuunloockiingis certainly one of us, go find out more, it’s the site I have now been using for 6 of my phones following the database shut down.